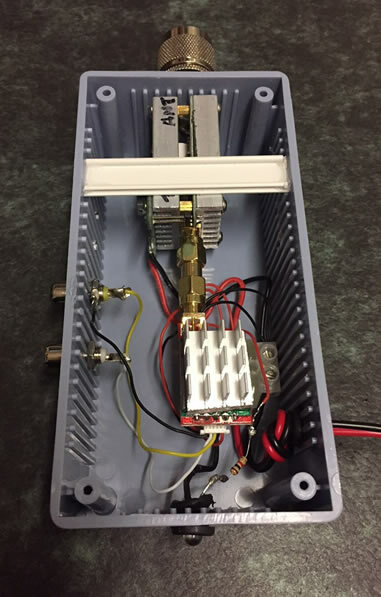 As stated the TX power of the 5.8GHz 600mW 32 Channels Mini Wireless 2dbm A/V Transmitter Video TX unit is only 600mw, but distances of up to 80 miles can be achieved with this power. Rather than needing to rely on attaching the linear amp 'as needed' (which is fiddly and runs the risk of damage/loss etc whilst 'in the field') I decided to build a separate linear amp TX unit. This is simply another 5.8GHz 600mW 32 Channels Mini Wireless 2dbm A/V Transmitter Video TX module which has been put into a case (as per the main TX unit – with heat sink, A/V sockets, LED etc) with the 5.8Ghz FPV Transmitter RF Signal Amplifier fitted 'in line' so that the antenna output is connected to an RP SMA / N Type connector.. The linear is held in place with a plastic bar to prevent any movement. Some additional holes were drilled into the case to allow for some extra cooling as the linear generates heat. This means I now have a complete and separate 2w TX unit that can be connected to the ATV system as and when required. Other than initial testing, as yet the station has not been run with the linear amplifier, but it will be during 2018 and it will be interesting to see what the results are like.